The media in the Czech Republic have carried a number of stories about the upcoming official visit to the country by Vietnamese Prime Minister Nguyen Xuan Phuc from April 16 to 18, underlining the development of the bilateral economic partnership. 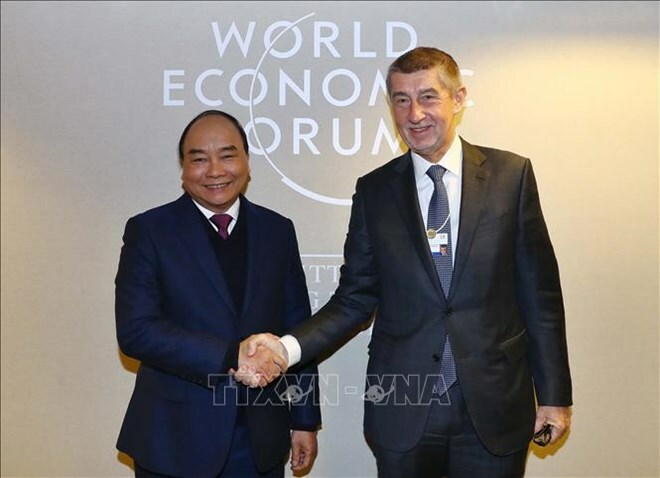 The Czech government’s website vlada.cz reported that Czech Prime Minister Andrej Babis will chair an official welcome ceremony for his Vietnamese counterpart on April 17. One of the key contents of the talks between the two PMs will be the enhancement of bilateral economic cooperation, it said, adding that the EU-Vietnam Free Trade Agreement (EVFTA) will help promote bilateral trade. The two leaders will open the Czech-Vietnam business and investment forum, according to the website. This will be the second meeting between the two PMs after their meeting on the sidelines of the World Economic Forum in Davos, Switzerland, in January 2019, it added. The Czech-Vietnam Friendship Association also highlighted PM Phuc’s upcoming trip to the Czech Republic on its website www.cvs-praha, saying the association’s Honorary President Marcel Winter and President Milos Kusy are glad to meet the Vietnamese leader. The Parliament of the Czech Republic posted on its website parlamentnilisty.cz an article titled “Potential to boost economic cooperation between Czech and Vietnam”, emphasising on the bilateral long-standing friendly cooperative relations and potential collaboration in economy, trade, and investment. The article said the bilateral cooperative relations have been stepped up in recent years, particularly through the visit to Vietnam by Czech President Milos Zeman in June 2017 and the visit to Czech by Vietnamese National Assembly Chairwoman Nguyen Thi Kim Ngan in April 2017. The sound political ties between the two countries have created a momentum for the development of the bilateral cooperation, including economy and trade, it said. The Czech Republic considers Vietnam a traditional and potential trade partner and a bridge to export its products to the Association of Southeast Asian Nations (ASEAN). Notably, in the Czech Republic’s national export strategy for 2012-2020, Vietnam was listed as the only country in ASEAN in its 12 prioritised markets. Two-way trade enjoyed an annual growth of over 15 percent to reach 1.2 billion USD in 2018, doubling that of 2013, according to the article. Vietnam exported coffee, pepper, fruits, tea, rubber, aquaculture, footwear, garment-textile, and fine art products to the Czech Republic while importing electronics, machinery, chemicals, dairy products, and pharmaceutical products from the market. As a member of the European Union, the Czech Republic is willing to cooperate with Vietnam in the fields of machine manufacturing, mining, food processing technology, agriculture and beer production, the article said. The EU-Vietnam Free Trade Agreement (EVFTA) will create opportunities for Vietnam and the Czech Republic to access to each other’s market effectively and increase trade flows in agriculture and food, it added. The article concluded that the Czech Republic always attaches great importance to the traditional friendship and cooperation with Vietnam and considers the Southeast Asian country an important partner and a gateway to boost cooperation with the ASEAN.